Many business processes are in place for historical reasons. Sometimes companies don’t even know why processes are carried out the way that they are. The reasons might have been valid originally, but businesses change. Unfortunately, business processes sometimes carry on well past when they should have been updated. An important step in streamlining business processes is identifying paper based documents and processes that can be converted to electronic. This includes creating as many self-service functions as possible. An Electronic Document Management System should work with both scanned documents and electronically created documents. This task requires the participation of management and employees involved with the intake and processing of the documents. Design input from participating employees is important to the success of the overall project. Why include employees at this stage? First, they have good ideas; second, it creates a stronger buy-in to the new way of doing things. Without a proper workflow anaylsis template, the chances for a successful project are significantly reduced. We strongly believe in the concept of “Peer Review” in all phases of project implementation. This concept requires that peers review all work before submission or completion. This approach not only reduces errors, but also brings more, varied ideas into the design. The Detailed Design Requirements and Strategy are important building blocks in the implementation of any successful business automation project. The first step in business process automation is to determine the documents and information that are moving through the organization. The documents must be categorized to determine the indexing attributes that will allow for fast and easy retrieval as well as monitoring throughout their lifecycle and records retention. While categorizing the documents, the lifecycle of those documents can be reviewed and documented. This will provide the information needed for ways to streamline the processes. This will also assist us in determining the retrieval needs as well as any type of reports that may be needed for monitoring the processes and effectiveness of the department. Once the documents have been categorized the format of the documents can be determined. Some of them may be scanned images, some may be submitted electronically, and some may be generated internally. Which documents drive essential business functions? 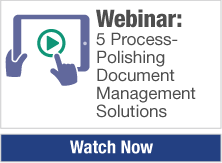 Which documents and processes have the highest potential for re-engineering or refinement to produce benefits? Which documents and process flows have an opportunity to be changed with the best probability for success? What applications and systems are used to produce the documents included in this review? Who are the major stakeholders with respect to responsibility for document performance and efficiencies? Who are the authors, readers, producers and stakeholders of these documents? What are the needs regarding efficiency, legislation and compliance requirements? How well are those requirements being met? To achieve the maximum benefit from automating business processes, we must ensure that the new processes are aligned with the business needs. To be able to measure the effectiveness of the automation project a baseline set of parameters must be measured using the current processes. This includes timing each step of a process and the time required to complete the entire process. Developing a process improvement plan and engaging the staff in the redesign effort significantly reduce the fear of change. This also improves the chance for success by bringing in the ideas from the people who do the work every day; also increasing their buy-in of the new processes since they were able to provide input. Part of the change management process is to assess the current skill set of the staff and compare that to the skills required to operate the new automated processes. Proper implementation of new business processes increases the ability to cross-train employees by automating the manual steps and letting them focus on tasks that drive revenue. The system manages the process and the people execute the tasks. Reduce Costs and Increase Productivity Today! So what processes do you have that need improvement? 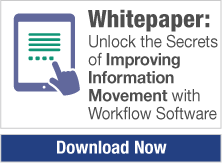 With our extensive knowledge of Document Management and Business Process Automation, we are uniquely qualified to provide workflow analysis that leads to real process improvements. Call DocuVantage at 866.367.3467 ext. 1 to schedule your analysis.